Other common names include Gould's Squid, Aeroplane Squid, Aero Squid, Seine boat Squid and Torpedo Squid. Arrow squid are distributed through southern half of Australia. They inhabit waters from estuaries to ocean depths of about 500 metres, although they have been caught in depths as great as 825 metres in the Great Australian Bight. They are most abundant over the continental shelf from 50m to 200m. They are schooling animals that tend to aggregate near the sea bed during the day and disperse throughout the water column at night. Catch rates usually decrease at the surface during the full moon period. Spawning occurs in all months. They are relatively short lived, probably reaching a maximum age of only 12 months. Arrow squid feed mainly at night. They eat pelagic crustaceans, fish and squid. Cannibalism is common in larger arrow squid but their prey is normally less than half the size of the predator. Arrow squid are eaten by a variety of fish including school shark, gummy shark, whiskery shark and john dory. Squid are specialists in the open sea. Slick and speedy and with torpedo-shaped bodies, squid rocket through the water by squirting water through their siphons. Fins along their sides act like the wings of jets, steadying them as they go. Squid have eight arms, but they also have two longer appendages, called tentacles, specialized for capturing prey in the open ocean. Location Southern half of Australia. Squid are an excellent bait especially for fish like Jewfish, Kingfish & Snapper. Squid normally like to hunt around weed & kelp as it provides a bit of cover for them to use when they are hunting & to protect them from predators also. You will find squid in most areas that have a weedy bottom. Squid will turn up just about anywhere at times so working a squid jig while you are fishing for other species is always worth the effort. At night most wharves that have lights shining on the water are excellent squid areas as the light attracts small fish which the squid hunt. Squid and Calamari should be cooked either quickly over high heat or for a long time over low heat, otherwise the flesh will be tough and chewy. Either way it has a mild flavour and firm texture and will marry well with almost any flavouring. It is suitable for a wide variety of preparations, whole tubes can be stuffed and baked, strips or rings can be dusted in seasoned flour and deep-fried or marinated and char-grilled or stir-fried. Arrow Squid are a pelagic species found over the continental shelf from the surface waters to the bottom at depths of up to 500 metres. They tend to concentrate in areas of up-welling and oceanic convergence. N. gouldi occurs in the warmer waters around the North Island and the northwestern South Island, while the more predominant N. sloanii is present along the southeast coast of the South Island and in southern waters. Similar species are found around southeast Australia, Fiji, the Philippines, and South Africa. Both species of Arrow Squid are caught on the edge of the continental shelf, usually by jigging or trawling. Companies and their contact information that are Exporters of squid, importers of squid, processors and producers of squid, wholesalers of squid. 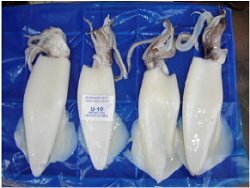 Links to information on Calamari squid, California Squid, Flying Squid, Giant Squid, Humboldt Squid, Illex Squid, loligo Squid, Narrow Squid, North Pacific Squid, Poulp Squid and Todarodes Squid.